Photography and video making is my passion. 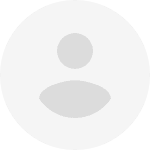 I create videos and photos for all purposes and budgets and provide quality professional products that meet your standards & needs. I will be happy to offer you customization at reasonable prices. Young mother and cute girl together on the kitchen close up. The kid touching and pulling mother's face with her small hands. Friendly relationship between mom and daughter. A happy family. Portrait of mother and daughter sitting at the Easter table. 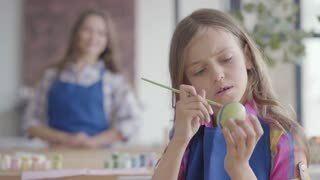 Cute girl paints an Easter egg with a thin tassel. Relationship mothers and daughters. A happy family. Preparation of the Easter. 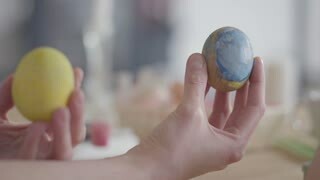 Woman and little girl holding Easter eggs and showing them to each other close up. Preparation for Easter holiday. Acrylic paint bottles on the table. Relationship mothers and daughters. Happy family. Portrait pretty mother and cute daughter sitting at the Easter table. Cute girl paints an Easter egg with a thin tassel. Relationship mothers and daughters. A happy family. Preparation of the Easter. Beautiful mother and cute girl together on the kitchen close up. The kid touching and pulling mother's face with her small hands. Friendly relationship between mom and daughter. A happy family. Young mother and cute girl chatting on the kitchen. The kid touches mother's face with her small hands. Friendly relationship between mom and daughter. A happy family. Pretty young woman and cute little daughter coloring easter eggs with colors and brush. Preparation for Easter holiday. Relationship mothers and daughters. A happy family. Cheerful mother and daughter sitting at the Easter table. Cute girl paints an Easter egg with a thin tassel. Relationship mothers and daughters. A happy family. Preparation of the Easter. Portrait mother and cute daughter sitting at the Easter table. Little girl paints an Easter egg with a thin tassel. Relationship mothers and daughters. A happy family. Preparation of the Easter. Pretty little daughter coloring easter eggs with colors and brush. Preparation for Easter holiday. Relationship mothers and daughters. A happy family. Little girl painting eggs with her mother using a small brush. A happy family. Preparation of the Easter. Woman and little girl coloring easter eggs with colors and brush. Preparation for Easter holiday. A happy family. Mom and little girl coloring easter eggs with colors and brush. Preparation for Easter holiday. A happy family. Portrait joyful mother and daughter sitting at the Easter table. Cute girl paints an Easter egg with a thin tassel. Relationship mothers and daughters. A happy family. Preparation of the Easter. Young mother and cute girl sitting in the kitchen. Little girl takes two Easter eggs and giving one to mom. Preparation for Easter holiday. Little daughter with long hair painting Easter egg using a brush at the table in the kitchen. Pretty woman standing near and smiling. Relationship mothers and daughters. Preparation of the Easter. 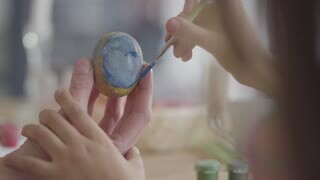 Little girl holding Easter egg and painting it with her mother using a small brush. A happy family. Preparation of the Easter. Portrait beautiful brunette woman eating cake. Attractive blond woman with curly hair eating cake in the restaurant close up. Attractive blond woman with curly hair eating cake. Portrait cute blond woman with curly hair eating cake in the restaurant close up. Portrait of young woman painting Easter egg with a small brush sitting in the kitchen. Preparation for the Easter holiday. Concept of creativity, traditions. Preparation of the Easter. Close up of mother and daughter hands coloring easter eggs with colors and brush. Colorful easter eggs. Preparation of the Easter. Mother and daughter have fun together. Close-up of mother and daughter hands coloring easter eggs with colors and brush. Colorful easter eggs. Preparation of the Easter. Mother and daughter have fun together. Portrait of cute girl with gorgeous hair in blue apron painting Easter egg with a small brush sitting in the kitchen. Preparation for the Easter holiday. Mother and daughter coloring easter eggs with colors and brush. Colorful easter eggs. Preparation of the Easter. Mother and daughter have fun together. Blurred figure of the little girl holding blue Easter egg with painted heart in hand, showing it to camera. Focus is on the hand. Concept of creativity, traditions. Preparation of the Easter.